Reference number for this case: 4-Oct-54-Chammard. Thank you for including this reference number in any correspondence with me regarding this case. 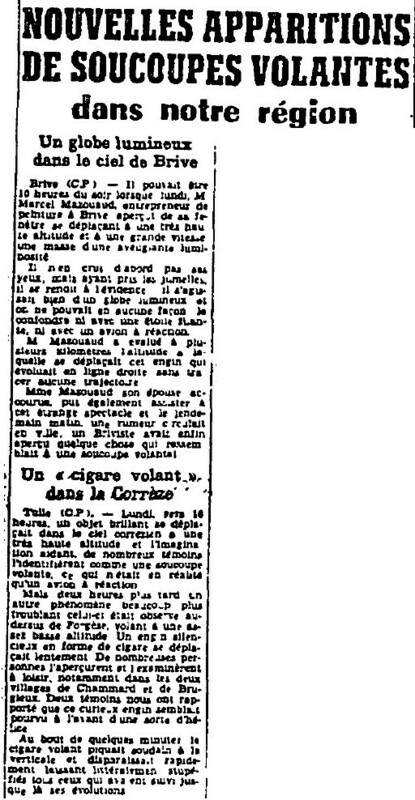 The newspaper La Dépêche du Midi for October 6, 1954, reported an observation on October 4, 1954, at 6 p.m. of a craft over Forgès in Corrèze, which was seen from the village of Chammard - actually a hamlet. The observations are from several places and the newspaper does not distinguish the statements of each group of witnesses, such as in Chammard. Overall, a cigar-shaped craft flew low, slowly and silently above Forgès, and after a notable time, dove vertically downwards where it was lost from sight. Two witnesses, perhaps those at Chammard, perhaps not, moreover, had indicated that the craft had a kind of propeller at the front. Brive (P.C.) - It might have been ten o'clock in the evening when, on Monday, Mr. Marcel Mazouaud, a painting contractor in Brive, saw from his window moving at a very high altitude and at high speed a mass of a blinding brightness. He did not believe his eyes at first, but having taken the binoculars, he accepted the obvious, it was indeed a luminous globe and it could in no way be a shooting star, or a jet plane. M. Mazouaud estimated at several kilometers the altitude at which this machine moved in a straight line without tracing any trajectory. Mrs. Mazouaud, his wife, was able to attend this strange display, and the next morning a rumor spread in town, a resident of Brive had finally caught sight of something that looked like a flying saucer. Tulle (C.P.). - On Monday, around 4 p.m., a brilliant object was moving in the Corrèze sky at a very high altitude and imagination helping, many witnesses identified it as a flying saucer; whereas it was actually only a jet airplane. But two hours later another much more troubling phenomenon was observed above Forgèse [sic, Forgès], flying at a low altitude. A silent machine in the shape of a cigar moved slowly. Many people saw it and examined it at length, especially in the two villages of Chammard and Brugieux. Two witnesses told us that this curious machine seemed to have a propeller at the front. At the end of a few minutes the flying cigar suddenly dove vertically and disappeared quickly leaving all those who had followed its evolutions until then literally stupefied. 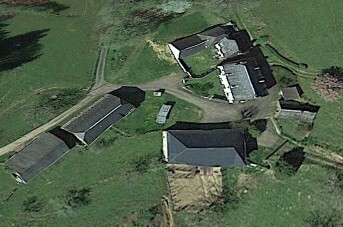 The hamlet is on the top of a hill. At 6 p.m. from this place, Venus is at the azimuth of 217° (yellow line on the map), its elevation is 11°. 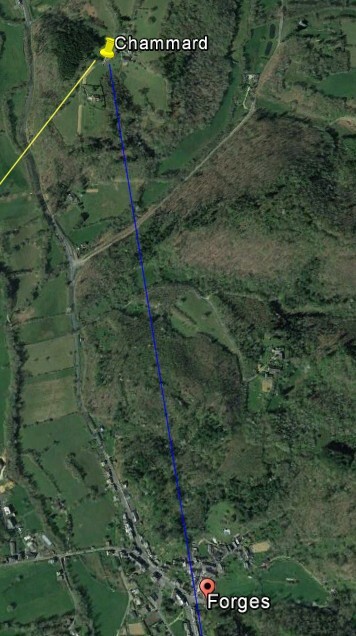 Forges is at 170° (blue line on the map). It is not exactly the same direction and it was still in the day, the night falling at 7 p.m.. Venus is thus not impossible, but hardly assured. 1.0 Patrick Gross December 29, 2016 First published. This page was last updated on December 29, 2016.